Tough choices don't have to be costly, when you understand how to choose the correct tool steel grade for your application. To begin choosing the correct tool steel, some assumptions are usually made. Many tool engineers will assume that D-2 is the standard tool steel. This assumption is made based on the fact that D-2 has been so widely accepted during the past 60 years. D-2 has been successfully used as a starting point in many industries because it offers a well-balanced combination of required properties. 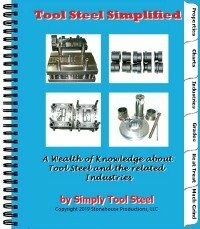 Since it is so widely accepted, it is easy for tool engineers to visualize which tool steel will provide the needed properties. Most tool steel producers publish some type of chart, graph or table similar to the one pictured in Fig. 1 below. In most cases, this graph will use D-2 as the standard tool steel grade and references will be made to D-2 (i.e. PM M-4 has twice the wear resistance as D-2). These graphs will generally show the relationship of D-2 and other tool steel grades.